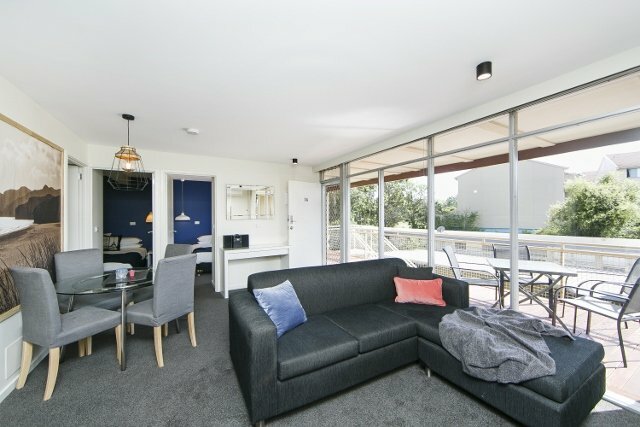 This gorgeous modern interior designed two bedroom unit in Griffith has just been renovated and offers 50sqm of comfortable living space. The property is cool in summer and warm in winter thanks to double brick construction and r/c air conditioning. There is a large private deck outside with bbq and outdoor furniture. We’re sure you’ll have everything you need here for a comfortable stay with king beds (or 2 singles), a study nook in bedroom 2, wireless internet, a large smart TV, washer/dryer combo and kitchen so well equipped you can cook a 5 course meal with ease. There is one complimentary under cover car parking space included with other ample of street parking if you have a second vehicle. McMillan Gardens is a quaint 1960’s development, so the outside they definitely look budget. Located on McMillan Crescent in Griffith ACT, just a 7 minute drive to the CBD, 10 minutes to Woden and 20 minutes to Tuggeranong and Belconnen. – Espresso machine and large flat screen smart TV. – Older building (inside and deck has been renovated, but not the outside of the building). This unit is so new that we haven’t received had any guests stay here yet … Would you like to be the first and review it for us?